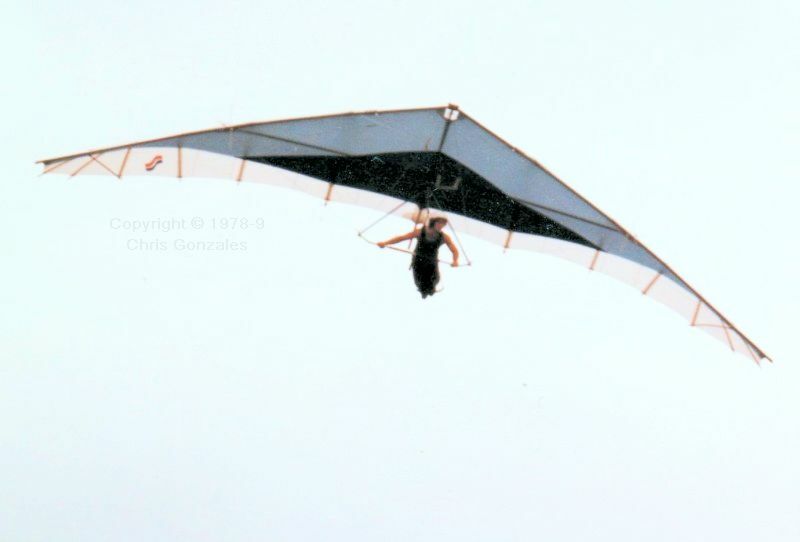 Sky Sports was a hang glider manufacturer based in Connecticut, New England, north of New York. (Do not confuse the east coast manufacturer Sky Sports with the similar sounding Sport Kites of California; later renamed Wills Wing.) At least some of their sails were made by Odyssey Sails of Wilton, New Hampshire. The flying in New England is arguably more demanding than in California, where most hang glider manufacturers were based, because of the wind and rain. A bit like where I live in old England, by the sound of it. However, unlike old England, the flying regions of New England are largely tree-covered, with ‘tree slot’ launches and tight landing areas. While some trained aeronautical engineers made great contributions to early hang glider development, on the whole they did not build better hang gliders than those who were self taught (whose mums doubtless thought they were geniuses). As far as I know, Sky Sports originally relied on designs by hang gliding pioneer Tom Peghiny, whose early work included a ‘cylindrical’ Rogallo wing with highly curved leading edges. His later work included a monoplane with a V-tail, which was nevertheless weight-shift controlled, like conventional Rogallo wings. When I started at Barber’s Hill, it was lush with Kestrel Bs, a string of them slowly advancing in stages up the path on the 200-foot hill. They glided flat and long, landing deep into a far hayfield. 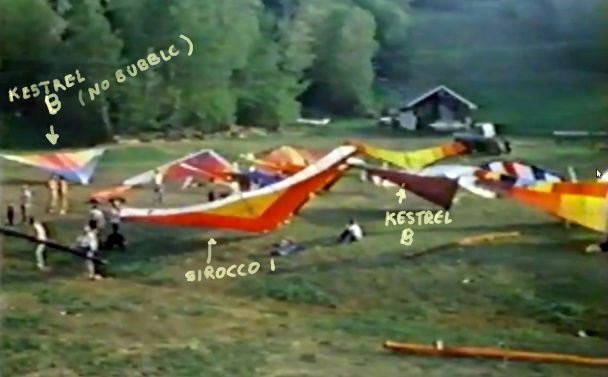 This screenshot from the Pico Peak 1978 competition film is annotated by Chris Gonzales to identify Sky Sports wings set up, presumably, near the landing strip. Incidentally, for a newer photo of the Sirocco 1 in the screenshot, see farther on. 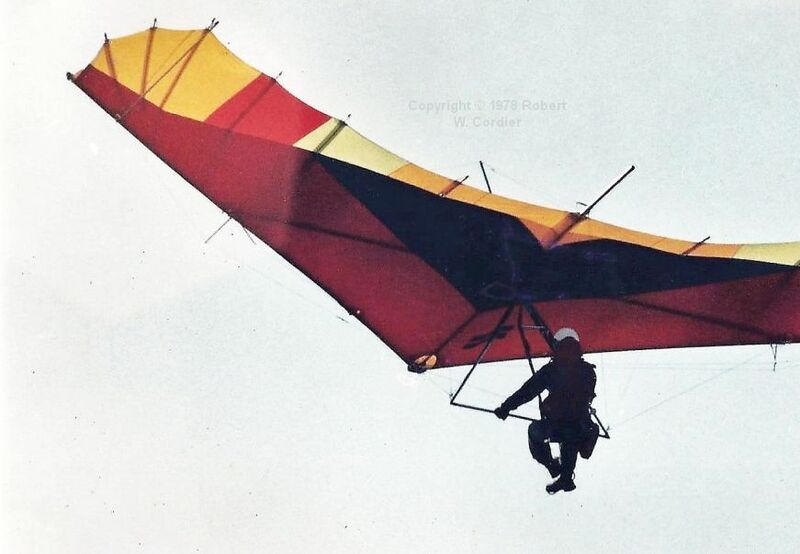 Eventually, Tom Peghiny was joined by another self-taught hang glider designer, Terry Sweeney, an electronics technician (self taught in that too) working in the field of radar jamming electronics for the military. 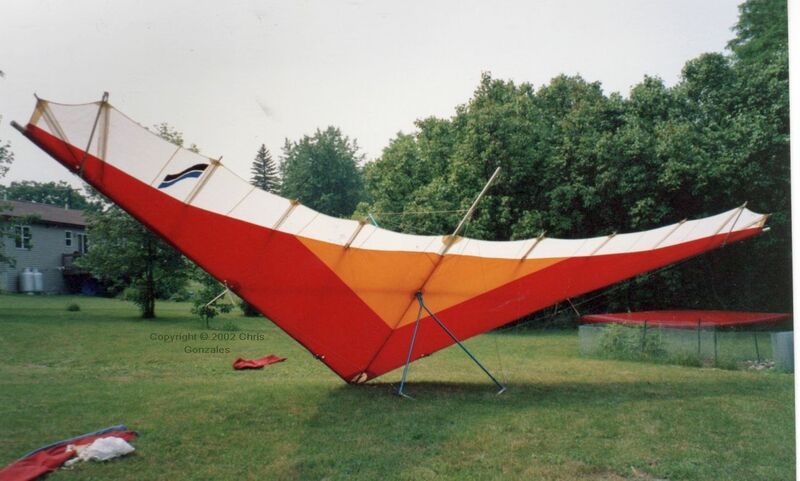 Together, they created the Sirocco, one of the first double-surface flex-wing hang gliders. 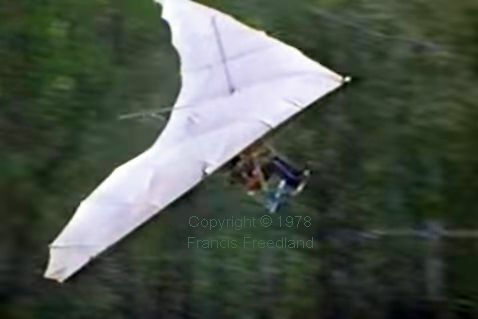 Notice the shape of the sail of the Sirocco in the accompanying screenshot from the Francis Freedland documentary film 1978 Pico Peak International Hang Gliding Meet (see my review, linked farther down). The inboard battens were secured in position with cables to the control frame corners and (apparently) to the top of the king post. The sail was thereby kept from applying upward (or in the event of severe misfortune, downward) force on the crosstubes. (Nowadays they build the crosstubes strong enough to take any additional bending forces imparted by the sail.) Those wires arguably also improved the span-wise twist distribution of the wing. Incidentally, the pilot in the screenshot is flying in a seat harness inside the control frame. This Sirocco 1 originally belonged to Chris Gonzales’ instructor, Mike McCarron. It is the actual same one in Chris’s annotated screenshot farther up this page. I was able to optimize for steep turns, say 60 degrees, the kind of turn you would use in a strong thermal core. With careful tuning, I could set up up a sweet spot within which the glider really coordinated well in that bank and climbed extraordinarily well. Sweeney worried about the lack of pitch stability of the standard Rogallo in a dive, as many of us did. At zero angle of attack, the sail ‘luffed’ (flapped uselessly) and created no lift to shift your weight relative to, so you were unable to pull out of the dive. Given enough height, the drag of the flapping sail would — in theory — pull you out, but we rarely gained enough height for that in those days. In 1973, Sweeney added a strut under the sail near each wingtip, with a cable to the top of the king post that limited the strut’s downward arc about its attachment to the leading edge. In an extreme dive, it acted as an up-elevator. It was a combined dive strut and reflex bridle, as we would understand it today. Bear in mind that the personal computer was still years away. 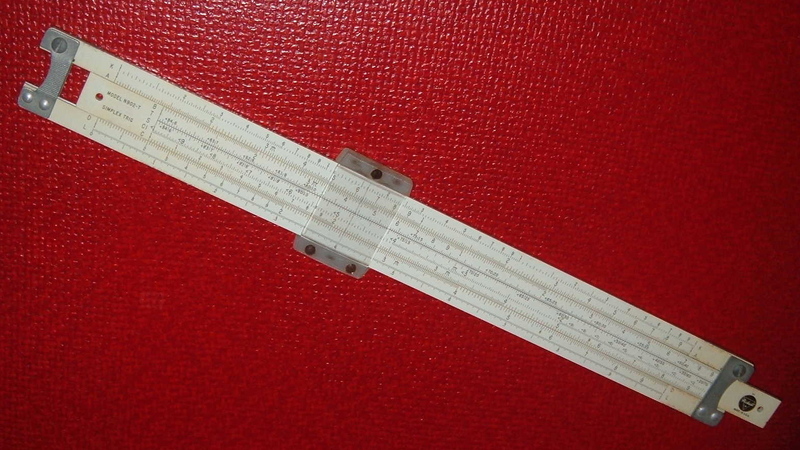 Unless you had links with academia, in which case you might obtain time on a mainframe computer, you either used a slide rule to aid hand-written calculations or you used a programmable calculator to help design your wings. If you were a bit outside the box, you used a Hewlett Packard reverse Polish notation calculator, which did not even have an equals = key! Boy, things happened fast in those days. They were literally designing faster than the magazine could report on them! A prominent pilot, who wants to remain anonymous, provided information and contact details of some potential and actual contributors. Bob Cordier provided photos via FaceBook Messenger. Chris Gonzales sent me info and photos by e-mail. In addition, I added more snippets from his subsequent article, Sky Sports Gliders of the Late ’70s, published in the USHPA magazine Hang Gliding & Paragliding, September/October 2017. Sky Sports was based in Connecticut, New England, according to their magazine advert in August, 1977. 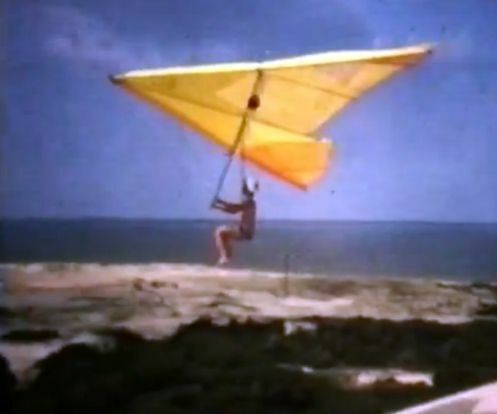 Details of the hang glider development process, including the use of programmable calculators, is from an interview with Terry Sweeney by Bill Allen, published in Hang Gliding magazine, August 1977. 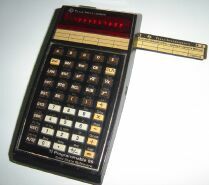 In addition, in about 1980, I used a desk-top programmable calculator at work (radar jamming electronics, same as Terry Sweeney). For a remarkable photo of the Sky Sports Sirocco, see this Oz Report forum post. On a Windows computer, right-click the partial image and select Open image in new tab or View image (or your browser’s equivalent) from the shortcut menu. For photos of another artistically painted Sirocco, see this post on hanggliding.org.